Dr. Moudy Elbayadi is a 2014 graduate of the PhD Program in Leadership & Change at Antioch University. 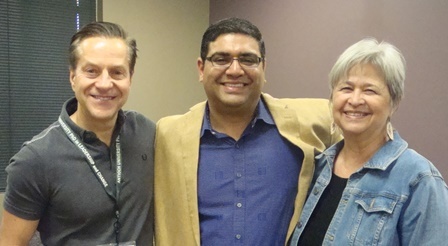 Above: Dr. Moudy Elbayadi [center] at his Dissertation Defense, Yellow Springs, Ohio 2014 with Dr. Mitch Kusy [left], Committee Member and Dr. Carolyn Kenny [right], Dissertation Chair. Dr. Moudy Elbayadi is the Chief Information Officer (CIO) at ID Analytics, Inc., the leader in consumer risk management with patented analytics, proven expertise, and real-time behavioral insight. As CIO, Dr. Elbayadi is accountable for the overall strategic direction and execution of information technology infrastructure, big data technology, service delivery, architecture, as well as data centers, networks and information security. 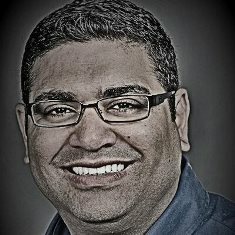 A recognized thought leader in the practical application of technology to deliver competitive business solutions, Dr. Elbayadi is passionate about enabling great customer experiences and helping technology companies compete on the web as the primary channel of delivering value to customers and clients. In addition to supporting large-scale web operations (100+ million users), Elbayadi is skilled at attracting, developing, and retaining great technical talent. Evoking excellence in others, building high performing teams and creating a great place to work form the principles he strives to apply each day. His recent research and study has centered on developing practices for relational leaders that want to transform their organizations by cultivating a DevOps culture and community of technology professionals. Over the past 18 years, Dr. Elbayadi has held both technical and business positions including service in banking and finance, legal, and large technology companies. Prior to joining ID Analytics in June 2013, Dr. Elbayadi held various leadership positions at the ACTIVE Network, Intuit, Inc., and IndyMac Bank. Most recently he served as the Vice President of global technology operations at the Active Network, where he helped lead a large IT transformation that included consolidating over 20 data centers, acquisitions and integration, and developing a next-gen hosting platform. Elbayadi, Moudy E., "Relational Leadership, DevOps, and The Post-PC Era: Toward a Practical Theory for 21st Century Technology Leaders" (2014). Dissertations & Theses. 145.